Dog behavioral studies have determined that the first twelve weeks of a dog’s life are vitally important because the puppy’s experiences during this time will affect his emotional responses as an adult dog. Those experiences begin, most importantly, with the breeder. From birth, when the puppy can neither see or hear, to eight weeks of age when he has full use of his sensory and motor systems, he goes through a most amazing growth process that occurs in precise stages. If a pup doesn’t have his physical and social needs met at any one of these periods, certain characteristics will be stalled. This, in turn, will affect how the dog will behave when he is older. For example, some dogs remain overly suspicious of anything new or different because they never developed investigative behavior when it was a normal part of their growing up. Another dog might be too easily excited, to the extent of appearing hyperactive, as a result of not having had adequate environmental stimulation during that stage. And both the shy and the hyperactive personality can be strongly affected by lack of human contact from three to seven weeks. So, you can see how important the breeder is to insuring that all the puppies are raised to their fullest potential. Conversely, you should also see why puppies raised in a strictly commercial environment, or a puppy mill, might grow up with behavioral problems. It is actually cruel to the puppies to deny them the socialization and environmental experiences they must have to live successful in our society as adult dogs. Any breeder who is unwilling to give the time and effort to meeting these early needs of a litter of puppies should leave the breeding and puppy raising to someone else. The beginning of the socialization period can be determined for each puppy by using the startle reaction test. When a puppy visibly reacts to a loud sound, he is into the socialization stage. This usually occurs around 21 days of age. Virtually overnight the puppy turns into an animated little being and is experiencing a shower of sensory stimulation. Puppies begin to interact, show dominance behavior, biting and learning bite inhibition from their dam, and express their individual personalities. 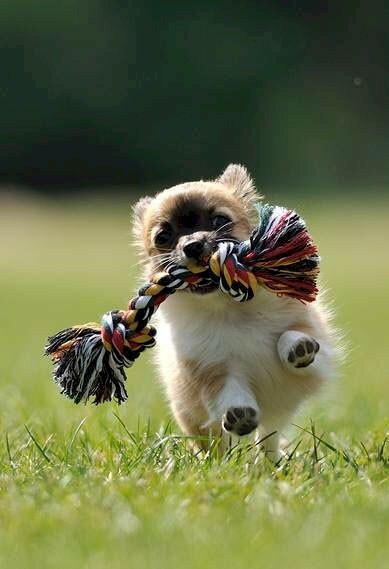 Puppies that are not allowed to act like a dog: i.e., rough and tumble play with other pups, investigating all corners of his world, experiencing some stress (separation, hunger, stress from handling or meeting new people) become perpetual pups. The breeder is actually cheating these puppies by not allowing them to experience normal developmental activities. This problem sometimes occurs with toy breeds or single puppy litters. 1. Provide a stimulating environment for the puppies. 2. Spend at least 5 minutes a day individually with EACH puppy. 3. Hold the puppy in different positions: on his back, head down, upright. Cuddle him, hold him up to your face, on your lap, etc. 4. By the third week, you can use your fingers to exert slight pressure on an ear or a foot. If he squeaks, he should calm quickly. If not, repeat the touch with no pressure for a few days and then progress to slight pressure. 5. By four weeks, the pups should be exposed to different flooring surfaces. 6. By the fifth week, each pup should spend some small amount of time each day away from her littermates. 7. From six to eight weeks, socialization with people and even more environmental stimulation is essential. Learn much more in How to Raise A Puppy You Can Live With. Kids playground equipment makes a great play area for puppies. A safely enclosed play area and puppies toys should be available to puppies. This entry was posted in dog training, PUPPIES AND PUPPY TRAINING and tagged care of young puppies, choosing a puppy, development of puppies, dog behavioral studies, early handling of puppies, play area for puppies, proper socialization of dogs, pup, puppies, puppy, puppy care, puppy mills, puppy socialization, puppy testing, raising puppies, socialization period in puppies, startle reaction in puppies, stimulating environment for puppies, toys for puppies, training puppies. Bookmark the permalink.